A STAR Wars-style gadget which lets callers see a 3D hologram of the person they are talking to is set to become a reality. The device will make live images appear to float in mid-air, just like in the sci-fi blockbuster. It works by using two lenses to capture 3D footage of a user, then project this on to a screen of water vapour at the other end. Polish developer Leia Display Systems — named after the character — hopes to have the device on the market within five years. And chief exec Marcin Panek says the company is working on walk-in hologram rooms. 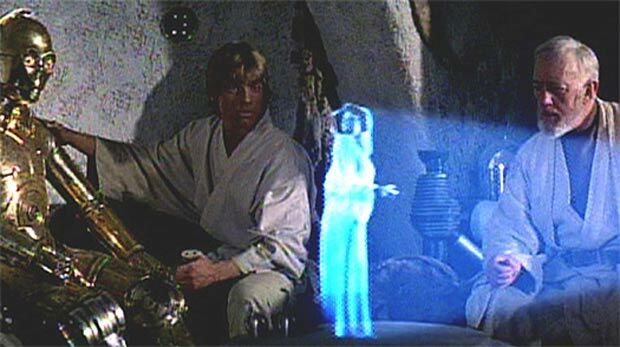 Devices capable of showing hologram football matches will be on sale within ten years, Mr Panek claims. He said: “We are on the frontier of technology imagined in films 40 years ago. It is science fiction becoming science fact. “It will be as if loved ones, friends and family are standing right in front of you while you talk with them halfway across the world. “At the moment our holograms are made using machines that are more than 6ft high but we are designing smaller versions that can be set up on a coffee table in a living room. Article written and sub edited by myself. Originally published in The Sun on Monday January 6 2014.